Car tuning is not as complex or ridiculous as films might suggest. Follow some basic steps and you can end up with more power, better fuel economy and improved safety. Before we get into how you can mod your car we have to ask WHEN WAS THE LAST TIME YOU CHECKED YOUR TIRE PRESSURE? Seriously, nobody inflates their tires properly anymore. Here&apos;s 5 things you can do without SPENDING A PENNY! It's amazing how quickly the weight of all that crap in your backseat/trunk can add up, and (depending on what kind of car you have) the effect it can have on mileage, handling, braking distance, etc. There's a reason "add lightness" is a common refrain among automotive types. My girlfriend is a teacher and a coach, and recently (after a few weeks driving around with all the crap she'd emptied out of her classroom after the end of the school year) she started complaining that her mileage had dropped several MPGs over the last couple of fill-ups. I went out to her car, and my jaw dropped. The backseat and trunk of her Subie was full of books and lacrosse equipment and random crap. I emptied the rough equivalent of two human beings out of her back seat and trunk, and had her check the mileage again after another tank of gas. She gained back about 3-4 MPG. I realize that any number of factors could contribute to so small a change, but her driving habits are very consistent, so I don't think this is coincidence. And it's not just mileage: you're changing the handling dynamics and weight distribution, put trace amounts of extra wear and tear on suspension components and brakes, etc. Sure, cars are made to haul stuff around, but they're not made to be storage units. Keeping unecessary weight in your car will cost you. 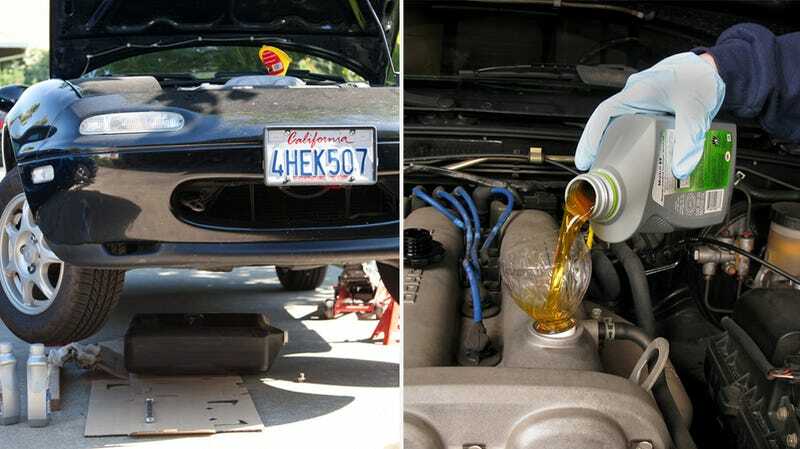 Oil change with synthetic, maybe something with a bit lower viscosity. GT4 aside I remember an old Hot Rod Magazine article from when I was kid, they picked up something like 5-15 horsepower with improved oil. They were testing different engines on an engine dyno. For the sake of turbo bearings and heavy duty minivan usage (not the same car), I always use synthetic, usually Mobile 1. I stick with the recommended viscosities but my cars always seem so much happier after an oil change. Poly bushings. Granted, this advice applies largely to older cars with some miles on them, but in my experience nothing has an immediate, "Whoa, that's different" result than replacing worn, rubber bushings with new polyurethane bushings. The most impactful parts to focus on, again in my limited experience, are shifter linkage, suspension A-arms and caster rods (if you have those, or just suspension components in general), and sway bars. Next on the list are engine and transmission mounts, just because that's a LOT more work. Then anything that requires you drop driveline components, like, say for example, the DeDion mount in a 116 series Alfa. Ugh. Your car will feel tighter, more agile, and meaner the first time you take it out. Also, burning out old bushings with a butane torch is a hoot. Just make sure you're outside, and don't breathe the fumes, duh. Give it more air and fire, get extra horsepower. Won't make you go any faster, but good music improves the cabin quite significantly. Getting an AUX port or upgrading your headunit to allow more sources of music. They make an immediate difference in handling. They are usually pretty cheap and quick and east to install. If there's no kit available, you can always make one out of some steel. The difference between the cornering performance/feel of my humble Fusion with the original tires from the factory vs. the Eagle GTs that I replaced them with is astounding. Tires should always be your first move. It's not just the looks. A lightweight set will improve handling and brake performance. As far as performance mods go, I'd say exhaust. Depending on your vehicle, you could get a catback kit for as low as $200, and while it's not likely that you'll gain much power, you will gain a little bit of response and a whole new feel to the car. An exhaust you can hear makes the car feel faster because you can hear the engine working, and that'll make you happy. Just make sure to do some research into the exhausts that are available and choose one that sounds like you want it to sound. Also, I'd recommend using a catback kit and not trying to make your own, it's difficult to make it sound good and avoid droning when selecting mufflers. Of course, this is moot if the stock system sounds great. As far as performance mods go, I&apos;d say exhaust. This move can get pretty expensive, but a good suspension is what sells Lotuses.